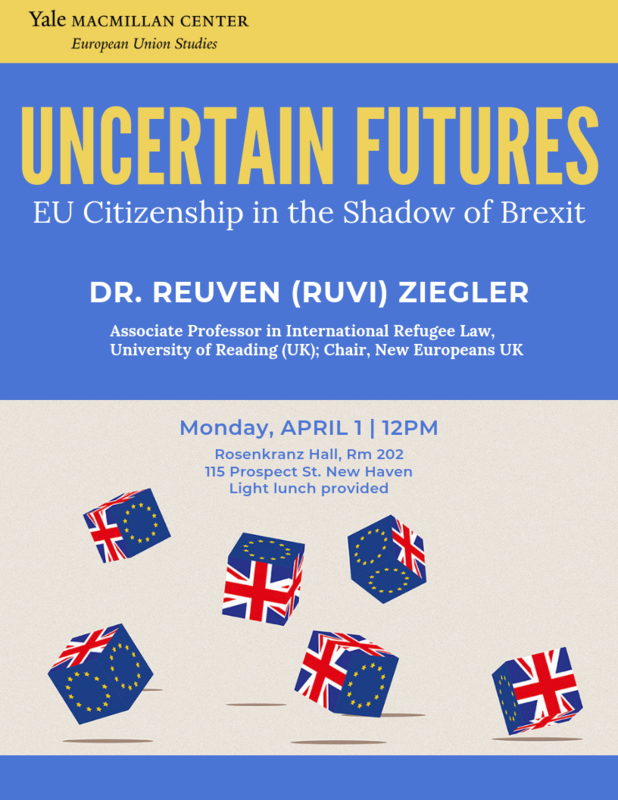 The EU Studies Program at the MacMillan Center presents a colloquium by Dr. Reuven Ziegler, Associate Professor in International Refugee Law, University of Reading (UK); Chair, New Europeans UK on “Uncertain Futures: EU Citizenship in the Shadow of Brexit.” Light lunch provided. Dr Reuven (Ruvi) Ziegler is Associate Professor in International Refugee Law at the University of Reading School of Law, where he serves as Director of Postgraduate Taught Programmes. He is an Associate Academic Fellow of the Honourable Society of the Inner Temple; Research Associate of the Refuge Studies Centre, University of Oxford; Convenor of the ‘Civil Liberties and Human Rights’ Section of the Society of Legal Scholars; Senior Research Associate of the Refugee Law Initiative (Institute for Advance Legal Study, University of London) and Editor-in-Chief of its Working Paper Series. Dr Ziegler’s public engagements include serving as Chair of the Board of Trustees of ‘New Europeans Association LTD’; Chair of the Oxford European Association; A ‘Britain in Europe’ academic expert; and an advisory council member of ‘Rene Cassin’. Previously, Dr Ziegler was a visiting researcher at Harvard Law School’s Immigration and Refugee Clinic and with the Human Rights Program and a Tutor in Public International Law at Oxford. Dr Ziegler’s recently published book is ‘Voting Rights of Refugees’ (Cambridge University Press, 2017). Dr Ziegler’s areas of research interest include International Refugee Law, Electoral Rights and citizenship, Comparative Constitutional Law, and International Humanitarian Law. Dr Ziegler holds DPhil, MPhil, and BCL degrees from the University of Oxford; LL.M. with specialisation in Public Law from Hebrew University; and a joint LLB and BA from the University of Haifa.